Your smile begins here… at Great Lakes Bay Orthodontics! 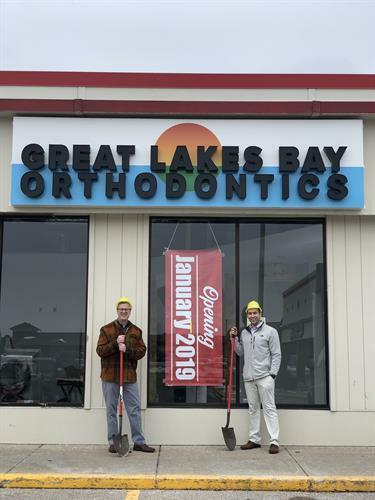 Great Lakes Bay Orthodontics is a specialty dental practice that is limited to Orthodontics for both children and adults; which includes Invisalign, Invisalign Teen and traditional braces. Dr. Andrew Grillo (DDS, MSD), Dr. Lisa Davis (DDS, MS) and Dr. Dale Davis (DDS) are Bay City's only Platinum Plus Provider of Invisalign® and Invisalign Teen®; and they are the top Invisalign provider in the whole Great Lakes Bay region, treating over 1700 Invisalign patients since 2000. We are a rare combination—big-picture thinkers who live in the moment. We stay alert to new advances, trends and technologies and are quick to incorporate them, but we never lose sight of the importance of being patient-centered. Creating beautiful smiles is where our story begins, but we keep finding new ways to write better endings. We believe in better and smarter technology. We believe in better connections that lift spirits and brighten lives. We believe in returning something from ourselves to build a better community. WE BELIEVE IN BETTER! Please contact us to schedule your FREE consultation.